"The Slab" on Newbury Street. The building you see above has stood vacant on Newbury Street since the early 1960s. Nicknamed "The Slab," it functions today as an artsy gathering spot for a variety of Bostonians. The building evidently once served a mode of transportation—not only are there double arches wide enough for vehicles to pass through, there are still ramps on the curb for vehicles to ascend. 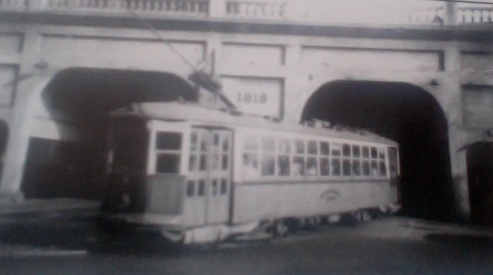 Type 5 streetcar entering the southern portal of the former surface station of Massachusetts Station on Boylston Street. Note that the facade of the station is exactly the same as that of the Newbury Street "Slab:"
The surface Massachusetts Station on Newbury Street as it appeared on November 17th, 1932, when streetcars stopped there. Image courtesy Boston Public Library. "The Slab" as it appears in 2014 on Newbury Street—abandoned, sealed and covered in art. 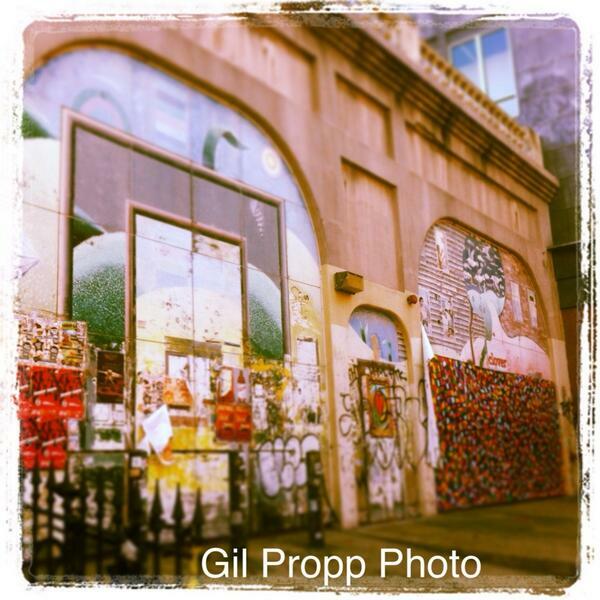 Image copyright Me (Gil Propp). 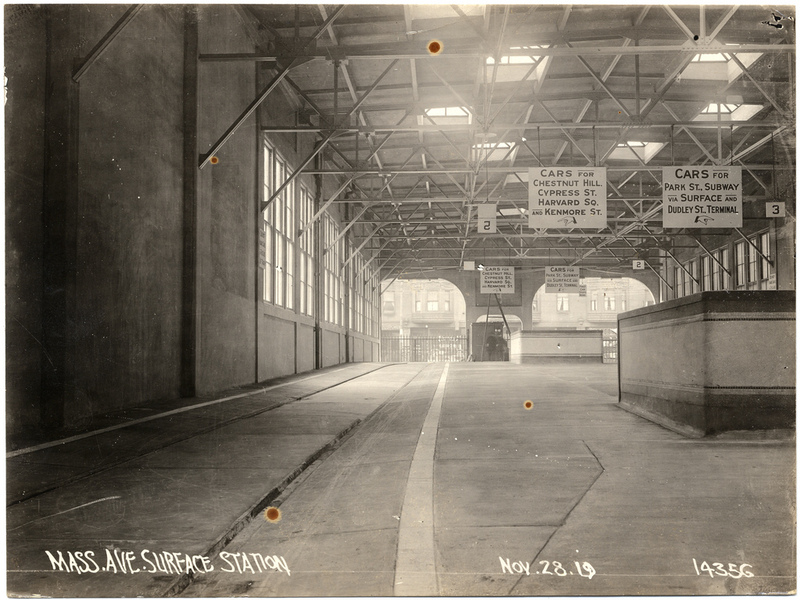 The surface Massachusetts Station opened in 1919, five years after the underground Boylston Street Subway Massachusetts Station, in space formerly occupied by storefronts. The surface station was directly connected to the underground Massachusetts Station via a staircase that still exists today, albeit behind a door and sealed off. 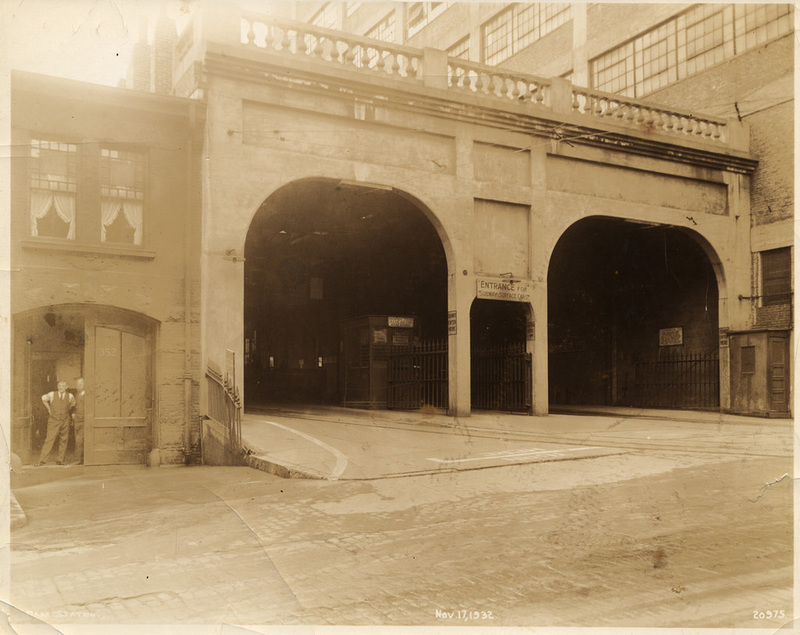 The station had two ends—one on Newbury Street, which remains today, and another on Boylston Street. 1917 Bromley map showing the underground Massachusetts Station at the corner of Mass Ave and Newbury Street, but storefronts where the surface station will soon stand. 1922 Bromley map showing the surface Massachusetts Station extending over the Boston and Albany Railroad ROW between Newbury Street and Boylston Street, in place of former storefronts. 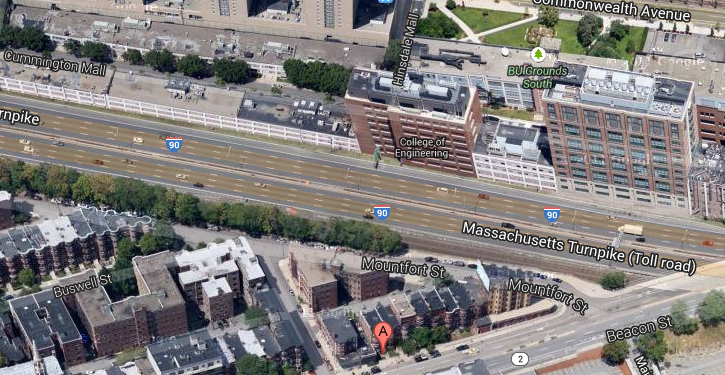 Also note that the Boston Transit Building has been built over the underground Massachusetts Station. The underground Massachusetts Station in the 1950s. 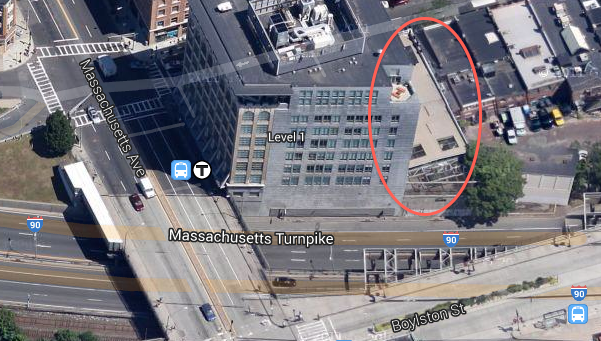 The arch circled in red was the passageway to the surface Massachusetts Station. The location of the passageway today. Note the hole in the wall next to the clock in the upper left hand corner—the passage, bricked over, is beginning to give way. 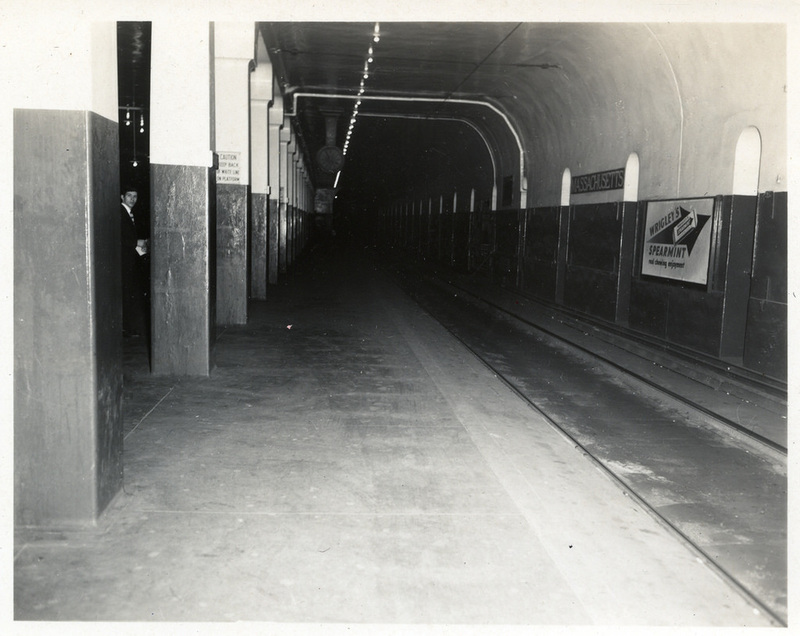 View of the underground Massachusetts Station in the 1950s—note the vintage BERy station sign reading "Massachusetts." 76 Streetcar on Newbury Street about to turn right and enter the Newbury Street end of the surface Massachusetts Station. The station is in between the taller building and the line of storefronts, where the Slab is today. The taller building, located on the corner of Mass Ave and Newbury Street, was once known as the Transit Building when it housed BERy offices. 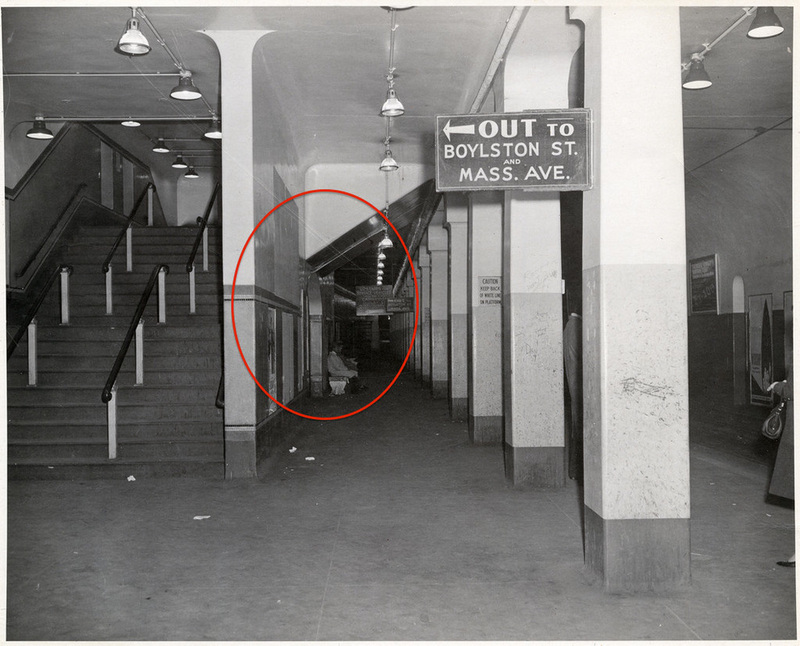 Accordingly, the entrance to the underground Massachusetts Station is still built into the building today. Image courtesy Bradley Clarke. 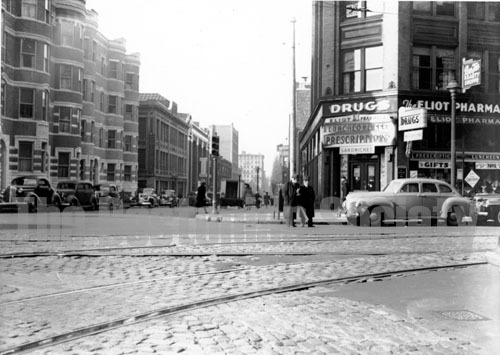 47 streetcar turning right onto Boylston Street from the clearly-visible, now-demolished Boylston Street end of the surface Massachusetts Station. Streetcars coming from north of the station, such as the 76 from Harvard Station, would enter via Newbury Street and exit via Boylston Street. Vice versa, streetcars coming from south of the station, such as the 47 from Dudley Station, would enter via Boylston Street and exit via Newbury Street. The switch at Massachusetts and Newbury Streets where 76 streetcars from Harvard would turn left onto Newbury Street to enter the surface station. While the building on the right exists today, all of the buildings of the left were demolished when the Pike was constructed. 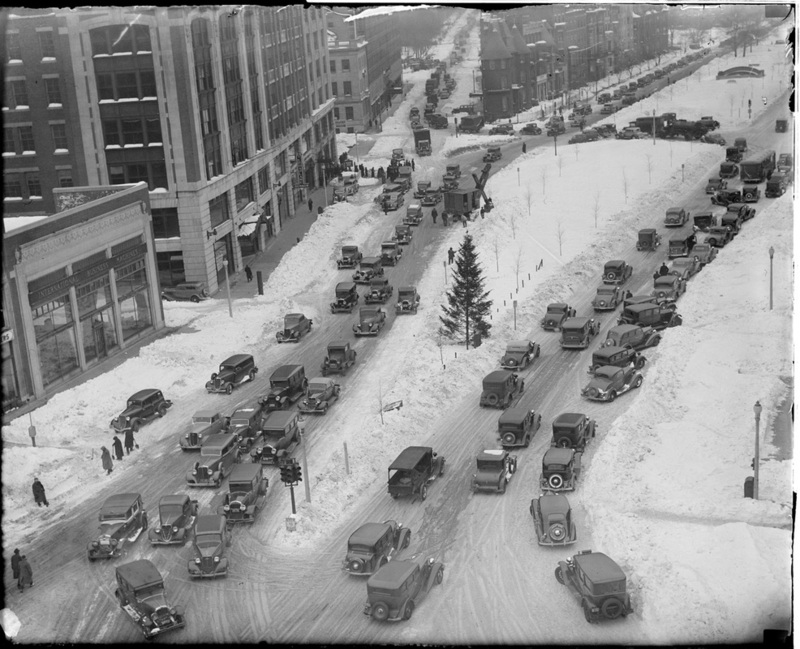 The switch at Massachusetts Avenue and Boylston Street where 76 streetcars headed to Harvard would turn right onto Mass Ave after exiting the station onto Boylston Street. Image courtesy City of Boston Archives. 76 streetcar turning right onto Mass Ave from Newbury Street. Image courtesy Bradley Clarke. 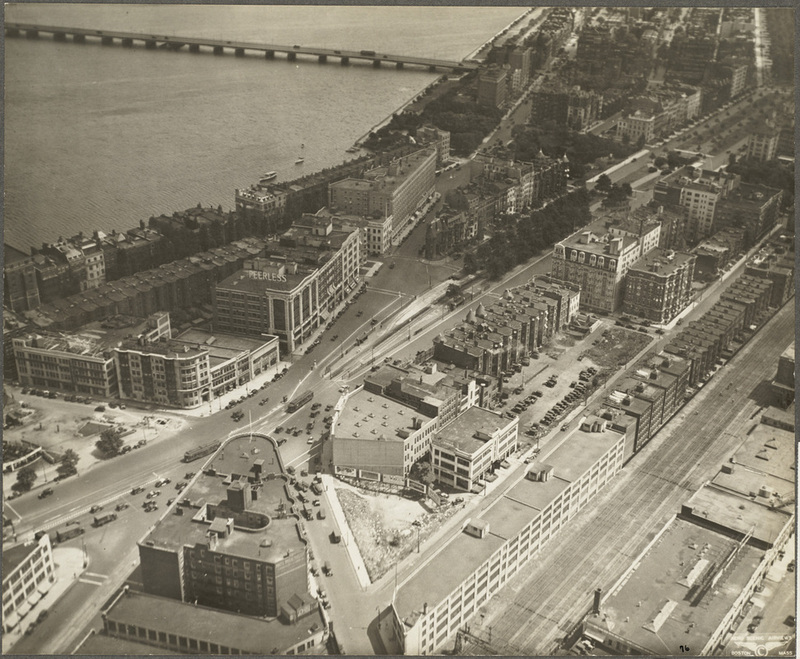 Prior to the construction of the underground Kenmore Station in 1932, and even afterwards for quite some time, Massachusetts Station was a significant transfer station in the BERy network, with streetcars and buses from all around Boston serving the station on street level and below. In addition to the 47 and 76, the predecessors of the modern 1/Harvard-Dudley bus, Massachusetts Station hosted the 54/Massachusetts-Bowdoin bus to the West End and the 55/Queensbury-Massachusetts bus, implemented to fill in for rerouted 58 and 60 service from Massachusetts to Kenmore. 1946 BERy map showing two streetcar lines and two bus lines stopping at the surface Massachusetts Station. The 58 and 60 buses, show to terminate at Kenmore in the map above, once terminated at Massachusetts Station as streetcars before the underground Kenmore Station opened in 1932. 1925 BERy map showing the route of the 58 and 60 streetcars along Ipswich Street to Massachusetts Station. 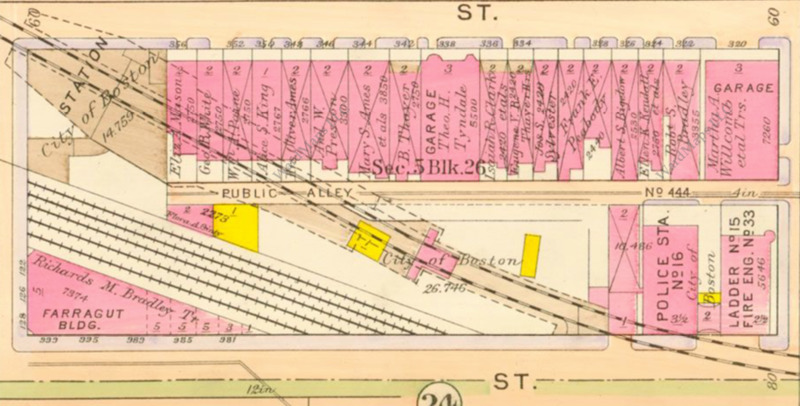 The streetcars entered the station via Boylston Street and exited via Newbury Street—note the half-circle by Massachusetts Station, which shows the trackage of the surface station. The interior of the surface Massachusetts Station. Image courtesy Boston Public Library. 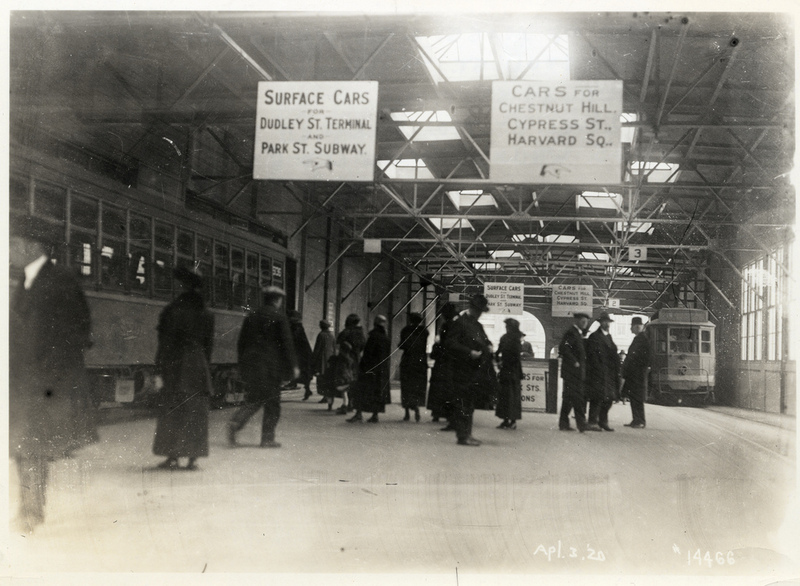 Interior of surface Massachusetts Station with streetcars and passengers. In 1932, all of the routes stopping at the right-hand platform except to Harvard Square will be bustituted and cut back to Kenmore Station. Image courtesy Boston Public Library. 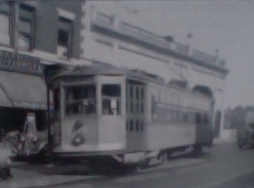 Once the underground Kenmore Station was built in 1932, the 58 and 60 streetcars were bustituted and rerouted to serve the new Kenmore Station. 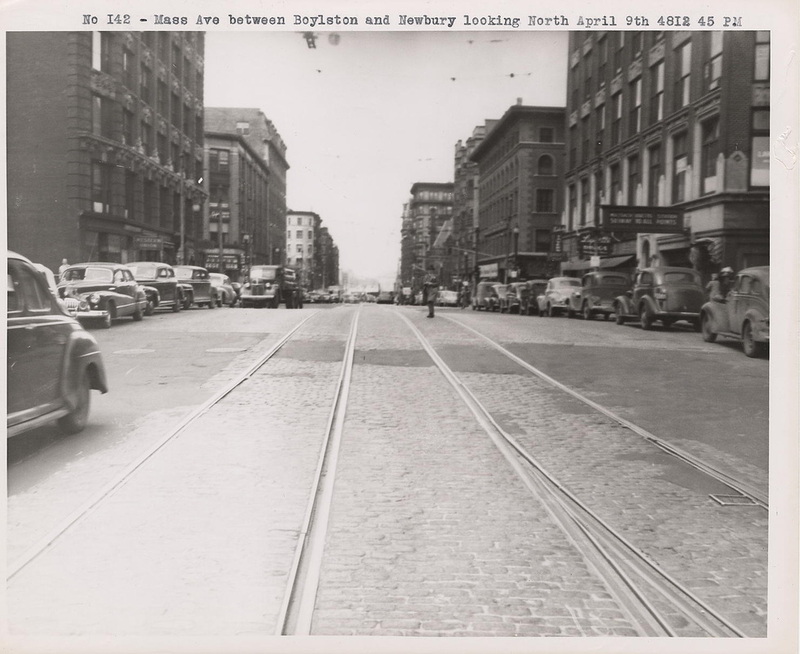 Kenmore Square following the construction of the underground station, whose entrance is visible at the top left corner of the photograph (look for the characteristic BERy subway entrance sign, like the one posted at the head of the Subway article). The old streetcar station in the center of Kenmore Station has been repurposed into a park, though the Kenmore Portal, which remains to this day, is still visible at the top right corner of the photograph poking through the snow. Buses, such as the one visible in the top right corner of the photograph near the Portal, now collect and let off passengers at the side of the road; later, a surface bus station will be built where the surface streetcar station once was. The routes that served the underground Massachusetts Station when the surface station was in use were mainly the same ones that do so today. The 61/Reservoir (Cleveland Circle)-Subway (C Line) and 62/Lake Street (Boston College)-Subway (B Line) have stopped there from the station's opening in 1914 until today, joined by the 4/Riverside-Subway (D Line) in 1959. The 69/Watertown-Subway (A Line) served the station from the station's opening until the line was terminated in 1969. An additional route, the 124/Braves Field-Subway, a special events route which ran with the A and B Lines along Commonwealth Avenue to terminate at Braves Field (see B Branch article for more information), stopped at Massachusetts Station as well. 1946 BERy map showing the 61, 62, 69 and 124 streetcars serving the underground Massachusetts Station. The layout of Massachusetts Station remained virtually unchanged until the early 1960s. Even so, the general changes to Boston transit between the early 1940s and early 1960s affected the station as well—the 47 and 76 streetcars were replaced with buses and trackless trolleys, respectively, in 1953 and 1950, respectively. In 1961, the 76 was converted to regular diesel bus operation, heralding significant changes that were to come to Massachusetts Station. In the early 1960s, construction began on the Boston Extension of the Massachusetts Turnpike/Interstate 90. The Pike was constructed along the existing right-of-way of the Boston and Albany Railroad through Boston, thereby requiring minimal demolition of buildings and the like. Yet even so, some demolition was required in order to sufficiently widen the right-of-way for shared car and train travel, and many buildings along the right-of-way were demolished to make way for the new highway. By 1963, the right-of-way for the Pike had been cleared. Note that the old Boston and Albany tracks are still in place—to construct the Pike, many buildings on either side of the right-of-way were demolished so the road could be sufficiently widened. This photograph is taken near Kenmore Square, just in front of and across the Pike from Fenway Park (note "Hotel Kenmore" sign on the left). The street on the left is Newbury Street; every building that once stood in Kenmore Square between Newbury Street and the right-of-way has been demolished. Remnants of the buildings' stone foundations are still visible above. Image courtesy Dirty Old Boston. 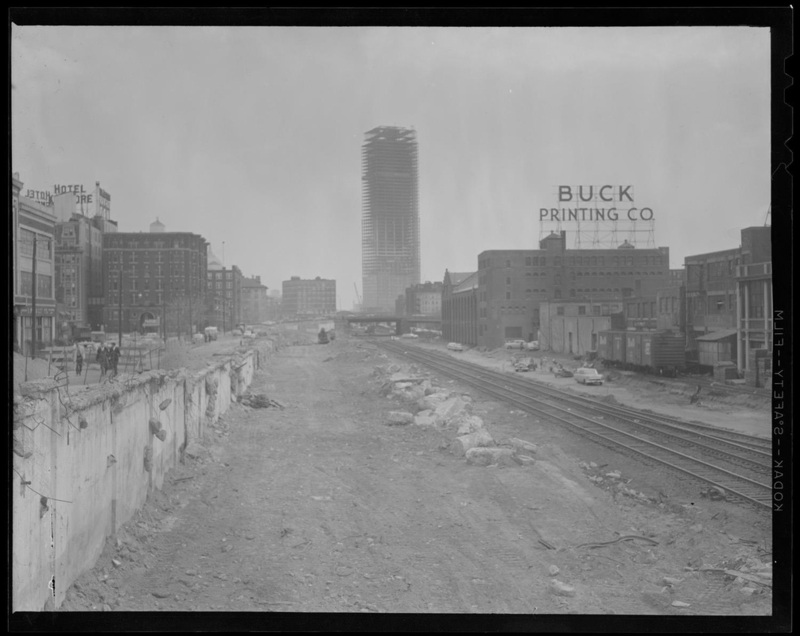 Also posted in the Subway article, the above photograph shows the buildings that once stood along Newbury Street near Kenmore Square and were demolished to make way for the Mass Pike. 1922 Bromley map showing the western end of the Fenway/Kenmore neighborhood, with Brookline just on the left. 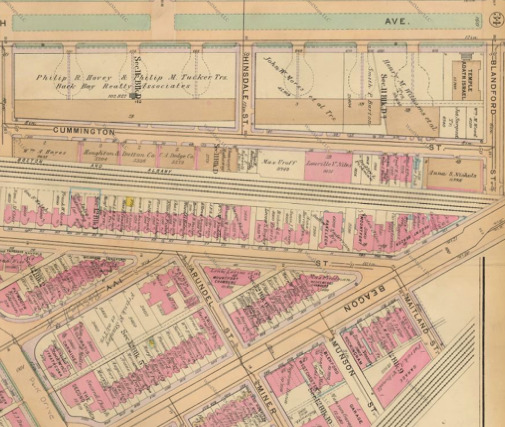 At the top of the map is Cummington Street and what was to become Boston University, and across the B & A RR's right-of-way is Mountfort Street. Between Mountfort Street and the B & A RR's right-of-way stand numerous apartment buildings. Map courtesy Ward Maps. As seen above, the construction of the Mass Pike necessitated the demolition of every single apartment building that stood between Mountfort Street and the B & A RR's right-of-way. Today, greenery and relocated railroad tracks stand where the buildings once stood. Image copyright Google Maps. While it was not fully demolished, one of the structures that fell victim to such demolition was the surface Massachusetts Station. The demolition essentially chopped the station in half; the station's frontage on Boylston Street was demolished in 1962 to make room for the Pike, leaving the frontage on Newbury Street intact. 1928 Bromley map showing the area around Massachusetts Station; top is Newbury Street, and bottom is Boylston Street. 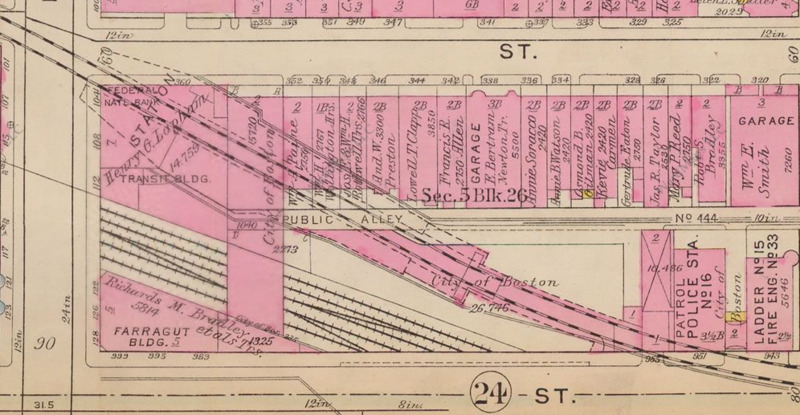 As you can see, a building owned by the City of Boston, marked as such as BERy was a city-owned authority, extended over the Boston and Albany Railroad's right-of-way, later to be repurposed into the Pike, with frontage on Newbury and Boylston—this was the surface Massachusetts Station. Note that the Bromley map shows the underground Massachusetts Station and the Boylston Street Subway as well! Map courtesy Ward Maps. A view of the surface Massachusetts Station extending over the Boston and Albany Railroad ROW that is now the Pike, as seen from Boylston Street in 1919. 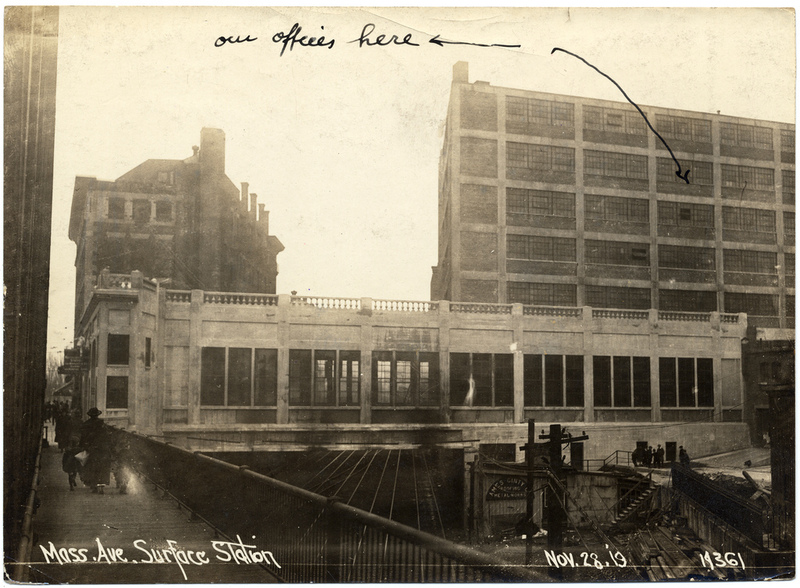 Note the handwritten "our offices here"—the surface Massachusetts Station was adjacent to what was then the Boston Transit Building, which still stands at the corner of Mass Ave and Newbury Street. Image courtesy Boston Public Library. 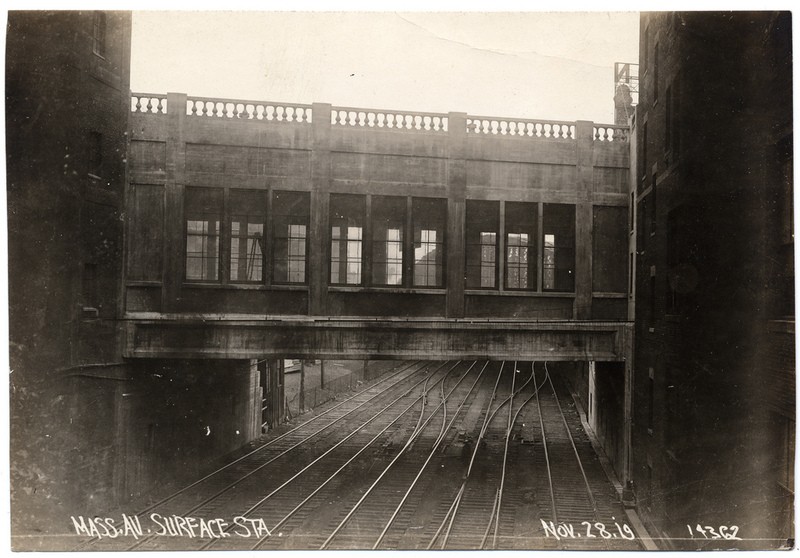 Another view of the surface Massachusetts Station crossing over the Boston and Albany tracks, courtesy Boston Public Library. The frontage of Massachusetts Station that remains intact on Newbury Street today is circled in red. As you can see, the station building no longer has frontage on Boylston Street, as that end of the station was demolished to make way for the Pike, which runs right by the intact station today. Without the surface Massachusetts Station for them to loop at, the 47/Dudley-Massachusetts and 76/Harvard-Massachusetts buses could no longer reverse direction at Massachusetts Station. Therefore, both routes were combined to form a new bus route, the 1/Harvard-Dudley bus, which operates to this day and stops on Mass Ave right in front of the since-renamed Massachusetts Station. A new surface terminal for Massachusetts Station was built on Mass Ave directly across the street from the entrance to the underground Massachusetts Station for buses headed in the direction of Dudley Station. Buses headed towards Harvard Station received a simple street waiting area. The new surface terminal for Massachusetts Station. Note the black boards at the right of the terminal, which cover a sealed passageway to the underground Hynes Convention Center Station. The passageway also had an entrance behind the terminal, covered in concrete today. The 55 bus continues to serve Massachusetts Station today; it has since been extended to Park Street Station further downtown. The 47 and 76, as mentioned previously, have since been combined by the MBTA into the 1/Harvard-Dudley via Massachusetts Avenue bus. A third bus, the CT1/Central Square-Boston Medical Center, serves the station as well. The MBTA still owns the Newbury Street frontage of the old surface Massachusetts Station, which has since been unofficially repurposed as "The Slab." 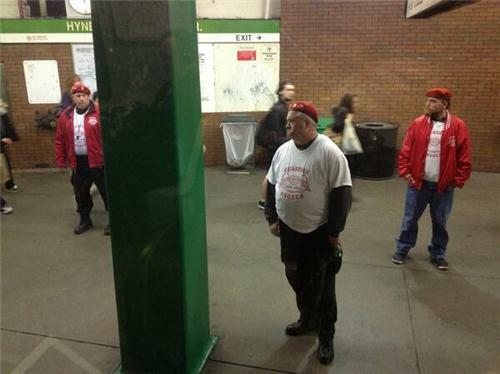 Last I heard, the MBTA was looking to lease the space. Hopefully the tenants, if there are any, will leave the Station's streetcar remnants intact, ensuring the remnants last for years to come.